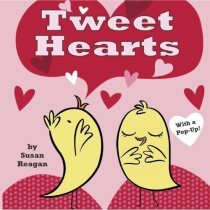 Two cute love birds and ten hearts star in this 5 ½” square board book, which counts down from 10 to 1, with the appropriate number of hearts acting out the action on each spread. I like the super-simple art style--the bird cage on the “9 hearts” page is one of my favorites. On the last spread a die-cut heart pops up from the fold in the middle of the spread to say I LOVE YOU. A simple, sweet tweet for introducing totz to spring!